GHunt is a free gay dating app designed specifically for finding gay sugar daddies and gay sugar babies. After launched for a short time, it quickly became one of the best free gay dating apps in this market. This app allows you to find guys anywhere in the world with its excellent features and a large member base. Regardless of whether you are looking for friends or a serious life partner, this gay app claims that it will make it happen for you as long as you can have a try. Read the comprehensive review of this app to learn more. 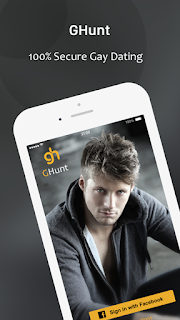 GHunt is a great gay chat app for members to use on their phones, so they can find matches and talk with them anywhere. The process of registering and creating a personal profile is much easier than signing up with other free gay dating apps. You can choose to sign up with two ways - Facebook account or an email address to create an account. If you choose to create a new account, you will follow the steps to complete your profile. The app will only collect some basic information, including password, nickname, date of birth, height, relationship status and hobbies. However, it requires all users to upload a profile picture to enable their account. In the end, new members will need to write down some words about themselves and their matches they are looking for. Then the app is there for you to explore. This gay hookup app is simple and it is also easy to navigate. Its navigation bar is on the left of the screen, which is easy to understand. Your profile photo is on the top of the bar for you to edit your profile to be more attractive. You can hit the photo to add more information about yourself to allow more members to find you. The QuickMatch is the most essential part on this gay app where members can find lots of potential matches according to their preferences. They can swipe right to like someone and swipe left to pass someone. Easy and efficient. Moments part is for members to post photos publicly to allow others to see and comment. So they can find more like-minded gay men here. Connections section lists those you have sent roses, those who have liked you and those you have liked. It is easy to check. GHunt is among the top free gay dating apps offering the best service to its members. It boasts the most useful features that can help gay men to connect with those they are interested and the most powerful matchmaking system to recommend like-minded people to its members. If you are looking for a place to find your best partner online, this free gay dating app for men is definitely the best choice for you.